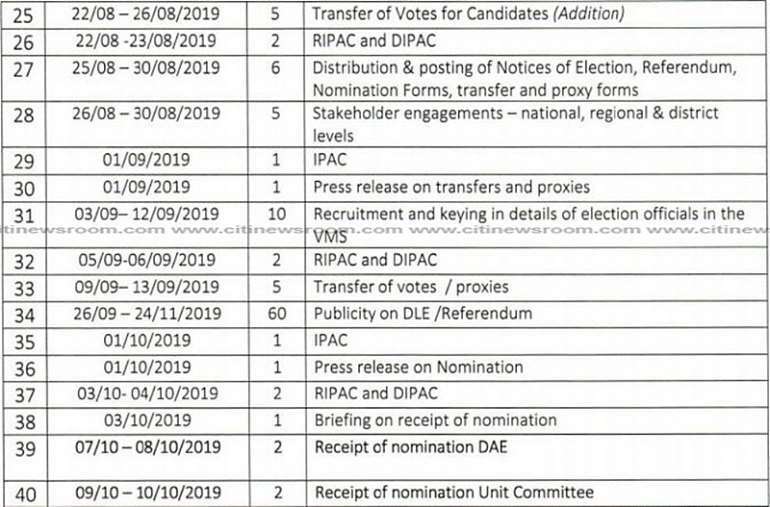 The Electoral Commission (EC) has set November 26, 2019 as date for the district level elections and referendum to amend Article 55 (3) of the 1992 constitution. 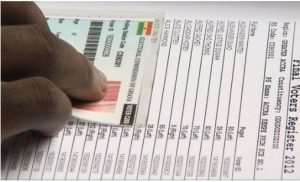 It has also released a timeline of electoral activities leading to the polls. 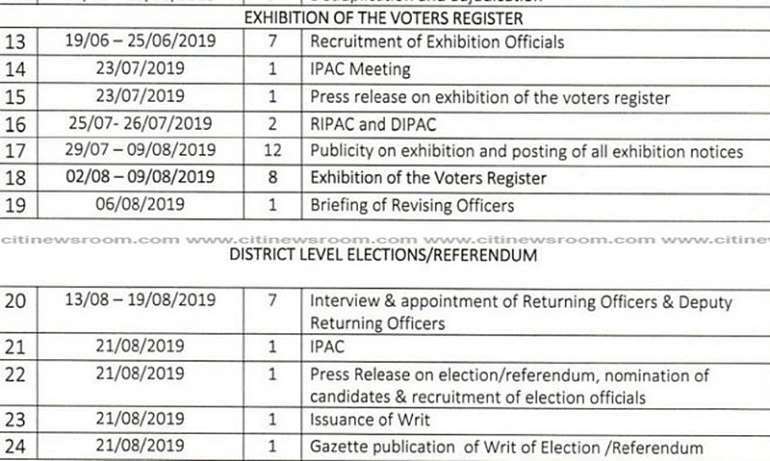 In the schedule issued by the Commission to outline the programme of activities for the 2019 District Level Elections and Referendum, registration of new voters will start from May 24 to June 13, with the exhibition of the register taking place from August 2-9 2019. 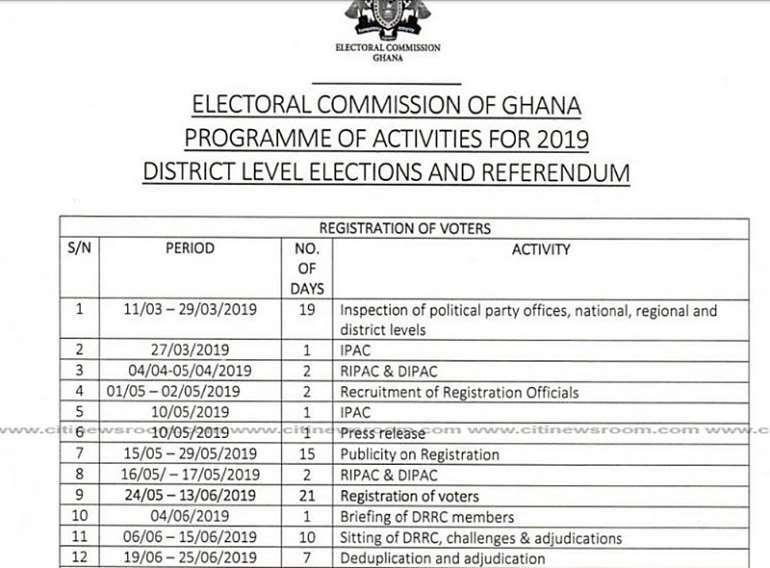 The EC had earlier announced that it, will conduct the district level elections for assembly members together with the referendum on the election of Metropolitan, Municipal and District Chief Executives (MMDCEs) in the last quarter of this year. 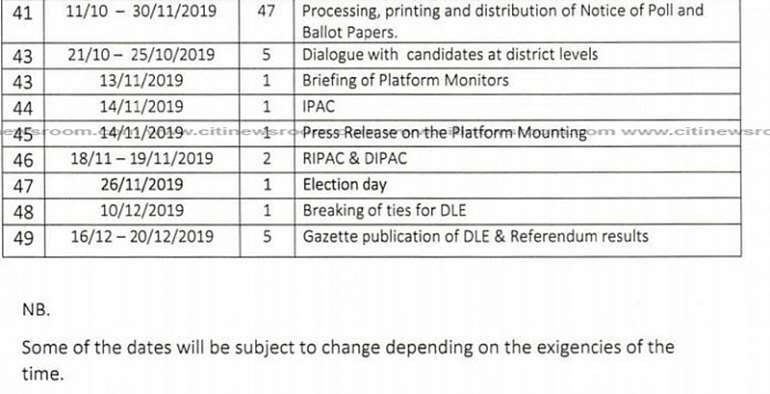 This will be the latest step in the Akufo-Administration's promise to oversee the direct election of MMDCEs within 24 months of election into office, to coincide with the District Assembly elections in 2019. The Government in February 2019 laid the Bill to amend the Constitution to allow for the election of MMDCEs. The Ministry of Local Government and Rural Development had earlier presented the Bill on the amendment of some articles in the 1992 Constitution back in October 2018. The articles slated for amendment are Article 243 (1) on the appointment of MMDCEs by the President and Article 55 (3), which prohibits the involvement of political parties in district-level elections. On the roadmap for the election, the government has indicated that the election process would be in three phases; Pre-Referendum Activities, Referendum Activities, Post-Referendum Activities and the amendment of Article 55(3) of the 1992 Constitution. The Pre-Referendum processes consist of the formation of an election committee , which was established in 2017 and the review of legislation and preparation of background document. The regional consultations and sensitization to raise and prepare for the referendum have also been conducted. Per Article 290 (4), at least 40 per cent of the citizens are expected to vote at the referendum with 75 per cent of them backing the Bill to be passed by Parliament and assented to by the President.